Heya I am Chase, the lazy programmer. A person with far too many years of programming experience. But anyway, I have here for you a simple mod to make your life easier. r stands for the full release version. b stands for the beta version. Click link in version history for ad-free download. Does not work in SMP. I am well aware of this, it only has a local effect. Automatic will install the mod on every version of the game you have installed that the mod supports. 2. Click YES on automatic install (first popup). 3. Read and follow the popup boxes directions. If you want to install it on a custom version of minecraft, see the following. 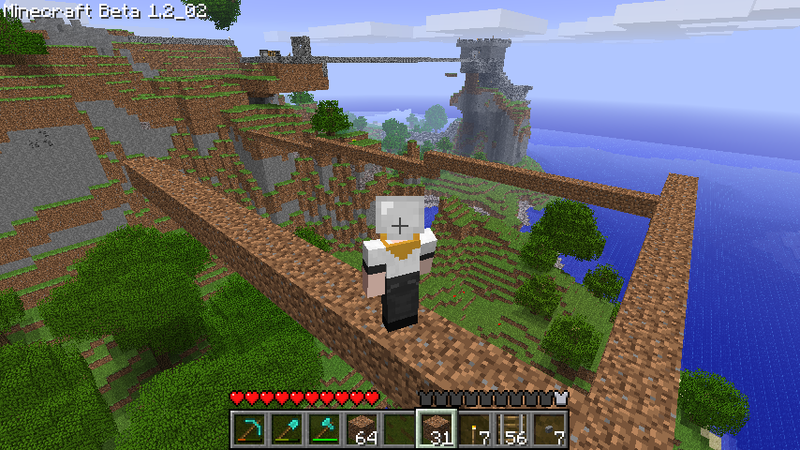 For customized versions of minecraft, such as one with forge. 2. Click NO on automatic install (first popup). 3. Click YES on custom install (second popup). 4. Read and follow the popup boxes directions. 2. Copy this folder and rename it to whatever you want. 3. Open the folder and rename the files similarly. 4. Open the json file and change the "id" to that as well. 5. Open the jar in an archive editor (WinRar/7-Zip/etc). 6. Delete the META-INF folder. 7. Copy the files from the downloaded archive file into the jar file, replacing previous files. Alright, here is the short of it for you. Hold control and place a block, it will place as many as possible in that direction till it hits something or you run out of blocks to place. Very useful for bridge building. Even in creative, it will only place as many block as as you have in the stack! It can do both vertical and horizontal placement. It modifies only the ItemBlock class only. Not many mods do this (that I know of), so should be fairly compatible. Suggestions, praises, and problems go below. The configuration file is found in the "config" folder in your main minecraft directory, the file is "./config/fastbuild.cfg". Run minecraft once with the mod installed to get the configuration file created automatically. The key that must be pressed to use fast build, any of the static key values from here should work. Determines the maximum number of blocks that will be attempted to be placed at one time. Determines the maximum number of blocks that will be attempted to be placed at one time in the vertical direction. None of these are adfly links. Because I think adfly should be an option, not a rule. +99% forge compatible (fairly certain anyway, but you still cannot drag and drop, must use the installer, WORKING ON IT). +Added support for 1.6.4, 1.7.2, 1.7.10, 1.8 all in one installer! +Config folder now automatically creates itself. =Thanks to Mojang, lines of blocks with orientations now position themselves correctly! =Fixed a few minor bugs. +Added max_stack_vertical_build_num property to config, that independently limits vertical build limit. Without the property it defaults back to the normal build limit. so you do not `have` to update your config files. =Hacked edition, since MCP toolchain is a pain to get and use. +Added the ability to switch which mode is the secondary one (in config). a.k.a. HELP IT DOESN'T WORK!!!1!!1one1!!eleven1!! I installed it and minecraft runs but I can't get it to work in game! You may need to put more then one item in the stack for it to place more then one item, even in creative. This works as a build in length adjuster. If you only have 1, it will only place one, which looks like it isn't working. I installed it and minecraft black screens! Be sure to delete the META-INF folder from the minecraft jar to get it to work. I installed it and minecraft crashes! Be sure you are using a fast building compatible with your version of minecraft. Help, it doesn't work in SMP! It looks like it does, but the blocks delete themselves. Sorry, the mod doesn't work in SMP, I removed the lockout due to many requests to be allowed to 'try it' in SMP. But I already knew it didn't work. How do I get this to work with forge? This probably doesn't work with forge. But try it and find out, it has been awhile since I have tested it with forge. Great work :biggrin.gif: Definitely helped with bridges! The vertical version would be a lot of help too. Vertical placement is in, I also streamlined the algorithms a good bit. Lost the alt (meta) key, if anyone really wants it back, please tell me. If you have any problems be sure to post such. When I hold down ctrl and place a block, it appears to place an entire line of blocks and takes them out of my inventory. I can even run out and stand on it if I am quick enough. However, a few seconds later all of the blocks except the original one disappear and return to my inventory. What am I doing wrong? How does vertical placement work? I couldn't get it to build up. You might be having a mod conflict. Do you know what other mods you are using? I know it works on the full version of the current beta for me. To place a vertical row you have to place it so you are looking up or down when doing so. It cannot know which direction otherwise (at the moment). I know your problem now. This mod does NOT work with multiplayer. I like this mod, but I've used Right Control to Jump for months. Is it possible to configure the key to something else? Like Right Alt or Space? I have a lot of mods so I need it to impact as few keys as possible. Plus future mods might need keys to operate so if it uses L or R control or alt, can it be altered to use a single key? has a "config.txt" file that allows users to customize this way. Honestly since I'm not a programmer i can't say anything bad about this. If you really wanted to slightly improve it, i would say make the block placement better. Like if you clicked from behind it would go forward etc. And maybe increase it from 15 to 30 or something. Click here and it would go the opposite no matter the way you look. And thank you so much for this mod. I greatly approve! I do not know where you are looking at all, just your location, where you placed the brick and the side of the block on which it was placed. However, how about this. If you hold both control and shift (sneak rather), and press on a wall, it will build outward along that side. You place it on the  side of this block, and it will build from there along the direction that that side faces, assuming it can (your not in the way, and it doesn't run into anything etc). I will also increase the block placement number up to 24. I do not want to make it too long. I will also see if I can make the current key configurable. Does that sound good for everyone? Updated, here is the information. Oh, and it still only uses one file. Thanks for the improvements. It's going to be fun to change how I play with this. Thanks! I try to be receptive to peoples wants. I also have a (very badly done) youtube video demonstrating the mod now. If anyone wants to do a better one, I will replace it. I love the new version! This mod+ Single Player Commands= huge bridges! Thanks again for this mod! It seems a little flakey in which direction it's going to build for me. I was trying to build a base wall between the corner stone on the left and the one on the right but FB decided to build way out in another direction than I had thought it would. Yeah, the original mode is still all kinds of flakey, since it is based on your location rather then your camera direction, its gotten better recently, but I need take some time and retackle that mode to use the look direction rather then player position. I haven't been able to get it to build vertically, but it works great for horizontal building, especially walls. I can't get this to work in single-player or multi-player mode. It's not like the instructions are hard. I followed them to the letter but it doesn't work at all. I'm sorry that's not much help, but any ideas what I could do? 2 possibilities. Mod Conflict or you didn't follow the instructions correctly. Also make sure you have Minecraft Beta 1.2_02. I set my build number to 1337 lol and used single player commands to give me 99999 smooth stone and loaded survival island. Then i built 4 pillers around it and filled it in and now i have a giant ghost city because there isn't any buildings. Once again your mod saved me hundreds of hours! Thanks a bunch!